Welcome to the INBA-LLM India Fair 2017 as an esteemed Guest Visitor. Read more about the INBA-LLM India Fair 2017, here. 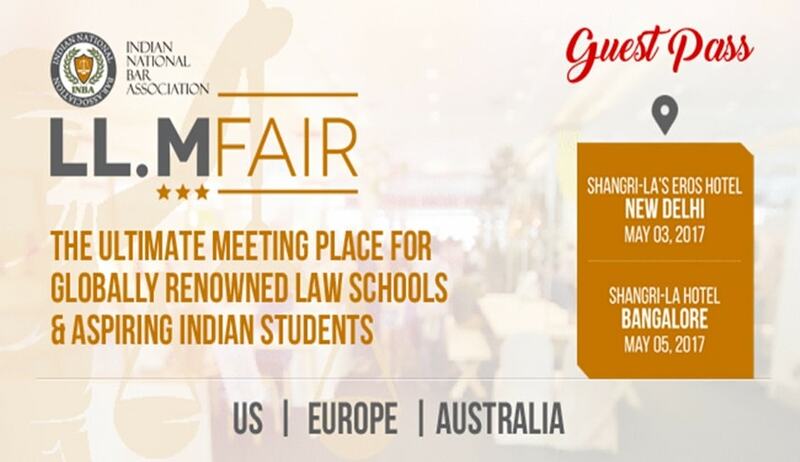 These landmark two-city fairs aim at providing the perfect platform for scores of aspiring Indian law students on one hand, and globally reputed law schools and universities from USA, Europe and Australia to meet and explore mutually and academically beneficial avenues of learning and growth. At this fair, overseas law universities and schools will be able to demonstrate their sterling LLM syllabi and streams, illustrious faculty and highly acclaimed programs to a house full of law students who are desirous of seeking overseas admissions and getting their dreams fulfilled. Meeting place for India based aspiring LLM students, their parents, law academicians & faculty members, and professionals from legal fraternity to meet up with globally reputed law schools from across 3 continents.